President GrybauskaitÄ— visited the Lithuanian pavilion at ICT2013. The information and communications technology conference ā€�ICT2013: Create, Connect, Growā€¯ in Vilnius, 6-8 November 2013, aroused great interest and attracted around 6,000 participants from all over the world. It has been the largest ICT conference in Europe this year and the first such conference in the region. ICT2013 has become one of the biggest events so far during Lithuaniaā€™s EU Presidency. It brought together Europeā€™s leading ICT researchers, European ICT policy makers, entrepreneurs, business people, students. 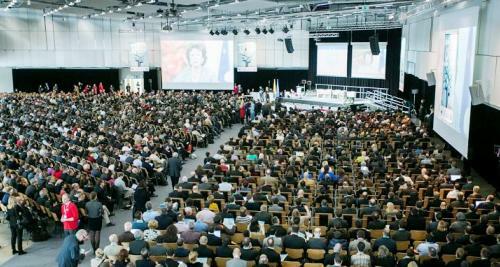 Co-hosted by Lithuania and the European Commission and it was opened by Lithuaniaā€™s President Dalia GrybauskaitÄ— together with the Vice President of the European Commission, Neelie Kroes. During the conference many ICT companies exhibited the latest innovations. In the exhibition there was a special pavilion, ā€�The Lithuanian Villageā€¯, where the best Lithuanian IT innovations were demonstrated. These included a novel transport surveillance system, an ā€�electronic noseā€¯ for checking meat and fish products quality, an underwater smart sonar probe to convey fishing information for fishermen, and many others. Some of those innovations might become just as successful as the already well known ground breaking GetJar and Pixelmator. President GrybauskaitÄ— emphasised ā€�that Lithuania is already among leaders in terms of developing the digital economy. We are well known for having an Internet speed among the fastest in the world; our mobile penetration is one of the highest in Europeā€¯. Using the conference as an appropiate forum, a memorandum of cooperation to establish Lithuaniaā€™s National Digital Coalition was signed. The momorandum was signed by government ministries, universities, and various other bodies involved with IT industry and IT applications. National Digital Coalition memorandum was also signed by Neelie Kroes, the Vice President of the European Commission.